The human body is a complex and connected system, so much so that a tight area within a muscle can cause pain in other parts of the body. We call these areas trigger points. Research suggests that there may be up to 620 possible trigger points throughout the body, which can often be the source of unexplained pain. For example, a trigger point in the back can produce a pain in the neck. And what’s worse is that this pain in the neck can then act as a satellite trigger point, causing severe headaches. Trigger point therapy—also called myofascial trigger point therapy and neuromuscular therapy—is an effective way of releasing these pain-causing trigger points. In today’s blog, we at Springs Integrated Health would like to discuss trigger point therapy. As Colorado Springs’ leading holistic wellness center, we offer an array of health modalities, like chiropractic care, physical therapy, deep tissue laser therapy, and hormone and thyroid testing. Learn more about our services, and contact us today to schedule your appointment. Most trigger points form from some type of muscular overload—often from too much exertion or repetition. For example, when you perform a task that exceeds your muscle’s functional endurance, you could form a trigger point. Similarly, when a muscle is overstretched for an extended period of time, this can also cause a trigger point to form. Because trigger points can demonstrate strange features and symptoms, they can be very hard to diagnose. If you have ever had muscle stiffness or begged a friend to dig into your back in hopes of relieving a pain, you may have already experienced trigger points. The best way of confidently diagnosing your problem is to visit a trigger point therapy specialist. At Springs Integrated Health, our team of chiropractors, physical therapists, and holistic experts can help determine whether you are suffering from trigger points. Trigger point therapy is designed to gently treat affected areas and help muscles return to their normal state. It often combines massage therapy and chiropractic care to provide the type of care that targets the exact source of the pain, not simply treating the symptoms. During these therapy sessions, strong pressure is placed on the pressure points until the contracted muscle releases and softens. There are a number of variations within this technique, and a skilled practitioner will choose the type that is most suitable. After receiving therapy, the patient will be given exercises and limbering activities to help retrain the muscle. What’s The Impact of Trigger Point Therapy? Muscle pain is a serious matter. They are one of the most common medical complaints, and trigger points are often a common source for the pain. Specifically, trigger points can cause a number of issues like numbness, weakness, pain, stiffness, and limited mobility. 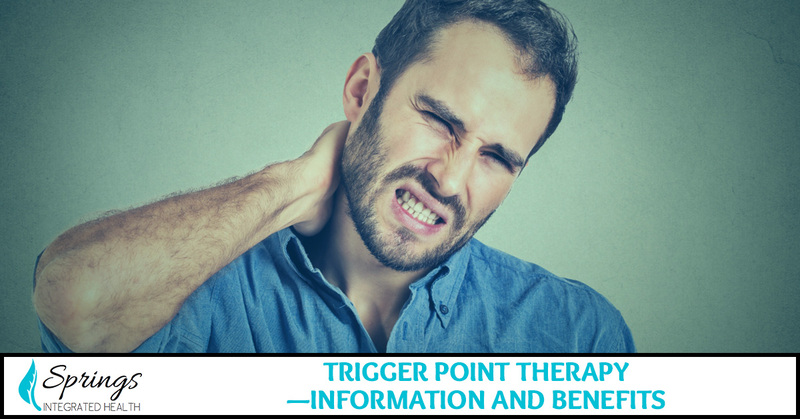 What makes trigger points such an important part of this equation is the fact that they can not only cause pain problems, but they can also complicate other issues and mimic other pains, making diagnosing the issue incredibly challenging. For example, some research suggests that symptoms of carpal tunnel syndrome can actually be linked to a muscle in the armpit, subscapularis. Similarly, many trigger point issues are often misdiagnosed as some sort of nerve problem. For example, sciatica can often be the result of pain in the gluteal muscle, not by an irritation of the sciatic nerve. Perhaps the greatest impact of trigger point therapy is that it has the potential to provide relief from pain while avoiding invasive procedures. If a mouse is in your home, you don’t run around the house with a bazooka ready to blow the rodent to bits. No, you address the problem with an appropriate solution. This is what trigger point therapy can be for some. Rather than overreacting and opting for injections or invasive procedures that can have long-term ramifications, trigger point therapy—especially, when coupled with other holistic treatments—can possibly provide simple, yet effective, relief for your pain. Contact us today to learn more about our services or to schedule your free health assessment and consultation!